Benzac AC Gel (Benzoyl Peroxide) is a topical treatment for inflammatory acne, including that which is severe in nature. It comes as a 10 per cent strength formula. The active ingredient in this gel is a type of organic compound which functions as an antimicrobial. Benzac AC Gel (Benzoyl Peroxide) is a topical treatment for inflammatory acne, including that which is severe in nature. It comes as a 10 per cent strength formula. The active ingredient in this gel is a type of organic compound which functions as an antimicrobial. It helps to eliminate propionibacterium acnes (a type of gram positive bacterium that can aggravate acne) and micrococcaceae bacteria present on the surface of the skin and in the sebaceous follicles. When applied directly to the skin, it begins to work as a peeling agent and causes dead skin cells on the top of the skin to be removed. This results in the sebaceous glands becoming unblocked and allows sebum (an oily substance which bacteria feed on, causing inflammation) to drain out. Without sebum, the bacteria eventually reduce in numbers. This gel also causes a reduction in follicular hyperkeratosis (a thicker than normal stratum corneum or outer skin layer), thereby leading to the treatment of lesions that may be present on the skin of those affected by acne. 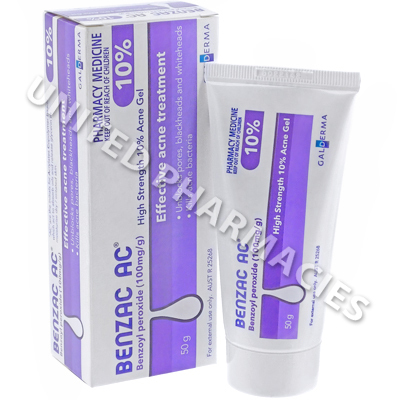 Benzac AC Gel (Benzoyl Peroxide) is applied topically. Prior to use, ensure that your hands are clean. You may also wish to use a gentle cleanser to clean the skin that needs treating. However, make sure the skin is dry before application. This gel is only to be applied to the area in need of treatment. Your doctor will provide you with accurate application instructions. Generally, patients are told to apply a thin layer of gel to the area of skin affected, allowing it to remain on the skin for a period of 2 hours, after which it is washed off using water. After this, a moisturiser which has been recommended by your doctor should be applied. If no irritation occurs after 3 days, apply the gel again in the evening, allowing it to remain over night. Patients who do not notice peeling of the skin or redness after 7 days or any signs of an improvement will usually be directed to apply it twice per day (once in the morning and again in the evening). The period of treatment will be determined by your doctor, based on the clinical response. You should notify your doctor of any side effects which bother you. Some serious side effects can occur as a result of using this topical treatment. If you experience severe burning or any other serious reactions, stop using the cream and see your doctor immediately. Applying this gel to your skin can make it more sensitive to the ultraviolet rays of the sun. Therefore, to minimise the risk of skin damage you should avoid any unnecessary exposure to the sun. This product is for external use only. It must never be ingested.